has a self-imposed cost: We must be good to one another." Along with First Lady Barbara Bush, his beloved wife of 73 years, George was a member of the Greatest Generation. He enlisted in the armed forces during World War II as a green recruit and rose through the ranks to become the youngest pilot in the United States Navy to receive his wings. During the war, Bush and his fellow combat pilots made use of the acronym “CAVU” – which stands for “Ceiling and Visibility Unlimited” – to describe a perfect outlook or situation. Bush kept a plaque of it in his office and explained in a letter to his children that the term represented his life and would do so until the day he died. Bush died just seven months after his beloved wife “Babs” passed away on April 17, 2018. To commemorate the lives of George and Barbara Bush, retired U.S. Mint Lead Sculptor Don Everhart has designed an incredible silver medal that features them as they lived through their 73 years of marriage: side by side. The medal’s reverse displays dual dates representing Bush’s presidency along with the now-famous acronym “CAVU” and its meaning. The designs are a stunning tribute from a legend in the numismatic world. Everhart, who has designed 14 presidential portraits for the U.S. Mint’s Presidential Dollar Series as well as the 2016 Coin of the Year award for his National Baseball Hall of Fame coin, retired from the Mint in 2017 after a career designing coins and medals that spanned more than 40 years. This limited-edition commemorative comes struck in one ounce of 99.9% fine silver, minted to a mirror-like Proof condition. No more than 2,500 of these magnificent proofs will ever be struck, so don’t delay – order yours now before these historic proofs are history! AN UPLIFTING TRIBUTE TO THE 41st PRESIDENT – This commemorative proof honors the memory of President George H.W. Bush and his wife Barbara, the former First Lady of the United States. Their portraits appear on the obverse of this medal. 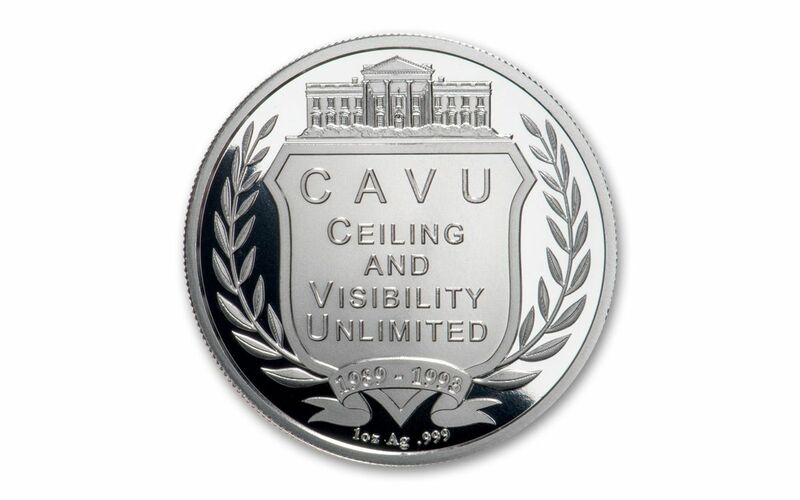 The reverse features the term “CAVU,” an acronym for “Ceiling and Visibility Unlimited,” the term that represented the former President all his life. The dual dates of 1989-1993 symbolize President Bush’s years in office. DESIGNED BY A LEGEND – These designs were created by retired U.S. Mint Lead Sculptor Don Everhart. A legend in the coin world, Everhart has designed 14 presidential portraits for the Presidential Dollar Series. STRUCK IN HIGHLY-PURE SILVER – Each George & Barbara Bush Commemorative medal is struck in one ounce of highly-pure 99.9% silver. 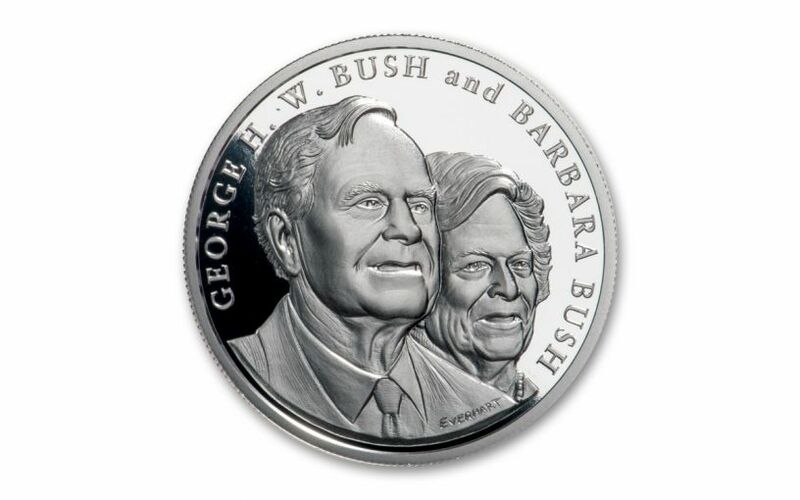 GORGEOUS PROOF CONDITION – Your George & Barbara Bush One-Ounce Silver Commemorative Medal will come in gorgeous Proof condition with frosted details and mirrored fields. EXTREMELY LOW MINTAGE – No more than 2,500 of these one-ounce silver commemorative proofs will be struck. The legacy of President George H.W. Bush continues to shine brighter with each passing year. Pay tribute to this great man with the George & Barbara Bush One-Ounce Silver Commemorative Medal. Click it to your cart today!